Cypress, CA- FOR-A Corporation of America will showcase its FT-ONE 4K super slow motion camera at the upcoming NAB Convention. This marks the NAB debut of the FT-ONE, which was first introduced last spring at Cine Gear Expo. FOR-A will exhibit in Booth C5116 at the show, which runs April 8-11 in Las Vegas. 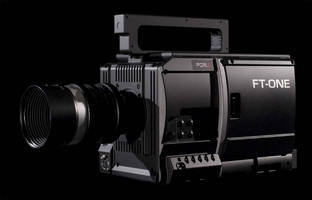 The FT-ONE can record up to 900 frames per second (fps). Employing FOR-A’s high-sensitivity CMOS color sensor, “FT1-CMOS,” the self-contained unit records and plays back full 4K (4096 x 2160 pixels). One output channel can provide QFHD (four 1080p 3G-SDI) outputs, while the other output channel provides down-converted HD-SDI for live viewing and play back. The FT-ONE captures images as uncompressed raw data on the system’s internal memory, which has a recording capacity of 9.4 seconds. This data is then stored on one of two hot-swappable SSD cartridges, each of which is capable of storing 84 seconds of full 4K resolution images at 900 fps. Since its introduction, the FT-ONE has received considerable attention as the world’s first full 4K super slow motion camera. The camera has been honored with multiple awards, including the TV Technology Europe STAR Award at the 2012 IBC Show, and TVBEurope’s Best of IBC 2012 Award. The FT-ONE was used during the football championship game this year in New Orleans, as well as playoff game coverage, where its high-quality 4K imagery was on hand to capture controversial calls for slow-motion playback. The camera has also been utilized in a variety of other professional sporting events, including broadcast of rugby games, automobile racing, and this past season of Red Bull Crashed Ice, a series of ice cross downhill competitions. The FT-ONE is ideal for both broadcast and digital cinematography applications.